The National Television Awards 2016 – all the red carpet looks! Tuning in to the National Television Awards 2016? Scroll down below for all the red carpet gowns, celeb gossip, and big news from the night! Tonight, over 150 limos will bring some of your favourite stars from daytime telly, prime time TV, and weekly dramas to the O2 – which has played host to the event for the last 6 years – in London for the National Television Awards 2016. 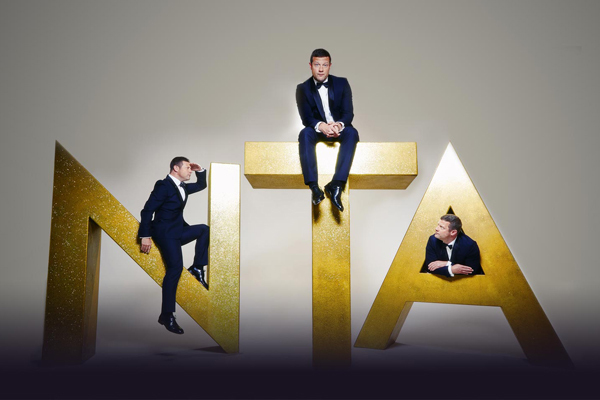 The awards, which will be live on ITV from 7.30pm, will be hosted by Dermot O’Leary – who has presented the show since 2010! Your favourite stars and shows will be fighting it out to take home the night’s prestigious awards – and the best bit? All the winners have been chosen by you, the public! 288 awards have been given out since the NTAs in 1995, with the first ever award going to Soldier Soldier. But who will win tonight? Will Ant and Dec walk away with the ‘Best Entertainment Presenter’ award for a 15th year in a row? Will Sheridan Smith bag another gong for her trophy cabinet? Stay with us on Facebook and Twitter to find out! Vogue WIlliams, wife of Brian McFadden, is one of the first celebrities to hit the red carpet tonight for the National Television Awards! What do you think of her bold, blue gown? 72-year-old Arlene Phillips proves that pink can be worn at any age in this pink, floral, frock. Mark Wright celebrated his 29th birthday at the NTAs with his wife Michelle by his side on the red carpet. How sweet are their colour coordinated looks?! Big Brother presenter Emma Willis looked stunning on the red carpet at the National Television Awards in an elegant dress with floral detail. She is currently pregnant with her and husband Matt Willis’ third child – and you can just see a hint of the bump starting to show! She is already mum to Isabelle, 5, and 3-year-old Ace, and the new arrival is due May 8th. Ronan Keating and Storm Keating put on a loved-up display at the National Television Awards tonight! The ‘This Morning’ star looked absolutely stunning walking the red carpet in this simple and elegant floor-length gown. GBBO judges Mary Berry and Paul Hollywood were both in attendance at the award show, wearing simple black outfits. Mary Berry, 80, added a touch of sparkle to her gown for the special occasion. They picked up the gong and Paul made the speech when The Great British Bake Off won the award for ‘Best Challenge Show’! Daytime TV presenting duo Eamonn Holmes and Ruth Langsford walked the red carpet together. GBBO winner Nadiya Hussain was thrilled to be at the NTAs and couldn’t hold back tears when The Great British Bake Off won the award for ‘Best Challenge Show’! Congratulations to Suranne Jones on her pregnancy! The actress looked radiant on the National Television Awards red carpet! Former BBC Radio 1 presenter Fearne Cotton looked lovely in a simple and chic gown whilst walking the red carpet for one of the first times since her little baby daughter Honey was born! Amanda Holden, 44, braved the cold to walk the red carpet in this sheer dress tonight with a thigh-high split! Poldark (aka Aidan Turner) on the red carpet at tonight’s National Television Awards – SWOON! He picked up an award for the public’s favorite TV moment – we can’t wait for the next season of Poldark! Darcey Bussell wraps up warm in a weather appropriate shrug! ‘Mr Selfridge’ actress Kara Tointon chose a pretty gown for her red carpet look. Chat show host and presenter Graham Norton turned heads in his bright and bold tux jacket. What do you think of this quirky take on classic black tie? Corrie actress Kym Marsh when for a dramatic dress on the red carpet, with sheer lace panels. Katie Price kept it simple in a black dress with her hair pulled back in a high top knot. ‘Britain’s Got Talent’ judge Alesha Dixon showed off her new haircut (and her long legs) in sheer trousers on the red carpet! Ladies in red! Daytime TV stars Lorraine Kelly, Charlotte Hawkins, and Kate Garraway all looked stunning in elegant red dresses that turned heads on the red carpet. Another colour co-coordinating couple, Peter Andre and Emily MacDonagh were super sweet at the NTAs! Queen of the Jungle Vicky Pattison showed off her amazing weight loss in a figure flattering white dress. She picked up an award for ‘I’m A Celebrity…Get Me Out of Here!’ with Ant & Dec.
Sweet and stylish couple Rochelle and Marvin Humes put on a chic display at the NTAs.